Finance is not available on this vehicle. 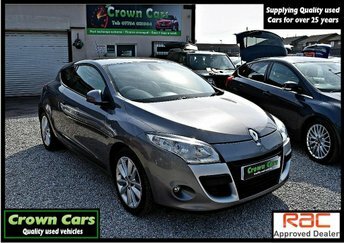 THIS STUNNING RENAULT SCENIC HAS BEEN CHERISHED BY ITS FORMER MATURE OWNER,ABSOLUTELY BEAUTIFUL ORIGINAL CONDITION THROUGHOUT,FANTASTIC TO DRIVE WITH GREAT SPECIFICATION ,GENUINE MILEAGE,NEW MOT UNTIL JANUARY 2020 & TWO KEYS ALSO INCLUDED IS 93 POINT MECHANICAL INSPECTION ++FOR MORE PHOTOS AND HD VIDEO WALK ROUND GO TO OUR NEW WEBSITE+ WWW.CROWNCAR-SALES.CO.UK++All our vehicles are HPI checked and prepared to a very high standard.All our cars go through a 93 point written mechanical P.D.I check in our own preparation centre.We pride ourselves on our fantastic reputation and repeat business from our thousands of happy customers.We offer a any trial or independent mechanical inspection inc Test drive with a no pressure relaxed sales environment. Any part exchange accepted.Please call our sales adviser Kerry for more information and to arrange a appointment for a test drive. We are easy to find at only 10 mins from M1/M62 motorways. We are open 7 days a week and late night viewings are available. Over 80 quality cars in stock from an established family business with over 25 years experience.We are fully F.C.A Accredited and can accept all major debt/credit cards and can offer fantastic finance deals to suit all. Delivery is available throughout the UK.Our stock changes on a daily basis so please call with requirements. Thank you for reading and hope to see you soon. We are located on the main Wakefield road in Featherstone behind the BP petrol station.Our post code is WF7 5HL for the sat nav, ..++SPECIFICATION INCLUDES THE FOLLOWING, 4 owners, Adjustable Steering Column/Wheel, Air Bag Driver, Air Bag Passenger, Air Bag Side, Air-Conditioning, Alarm, Alloy Wheels (16in), Anti-Lock Brakes, Body Coloured Bumpers, Central Door Locking, Centre Rear Seat Belt, Cigar Lighter, Computer (Driver Information System), Cruise Control, Deadlocks, Electric Windows (Front/Rear), Electronic Brake Force Distribution, Exterior Lighting, Extra Storage, Front Fog Lights, Gear Knob Leather, Head Air Bags, Head Restraints, Immobiliser, In Car Entertainment (Radio/CD), Mirrors External (Electric Heated/Folding), Mirrors Internal, Power Socket, Power-Assisted Steering, Seat - ISOFIX Anchorage Point, Seat Belt Pre-Tensioners, Seat Height Adjustment, Seat Lumbar Support, Side Protection Mouldings, Spare Wheel, Speakers, Steering Wheel Leather, Steering Wheel Mounted Controls (Audio), Third Brake Light, Upholstery Cloth, Windscreen Wiper, 4x15W Single-CD RDS Radio & 6 Speakers, Air Conditioning and Pollen Filter, Alloy Wheels - 16in, Alloy Wheels - 16in Nervastella, Front Fog Lamps, Single-CD/RDS Radio/6 Speakers/Fingertip Remote. 5 seats, Please visit www.crowncar-sales.co.uk to view our latest stock. Crown Cars is authorised and regulated by the Financial Conduct Authority, FRN: 740981. All finance is subject to status and income. Written Quotation on request. We act as a credit broker not a lender. We work with a number of carefully selected credit providers who may be able to offer you finance for your purchase. We are only able to offer finance products from these providers.